Sure, some people turnip their noses at it. But, a little free concert at the produce stand? There was romance among the rutabagas this afternoon in the Whole Foods grocery store, passion among the persimmons. 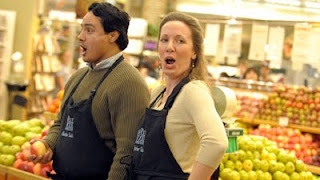 Five singers from the Washington Opera's young artists program took to the aisles of the Harbor East market at 1001 Fleet St., disguised in the black aprons and black caps normally worn by employees of the market. Above, Jesus Daniel Hernandez and Jennifer Waters sing to help promote their concert with the Baltimore Symphony Orchestra. LOL, Larry. It did look like the celery employees enjoyed it :) I bet it took a lot of thyme to set up that "impromptu" gig!